OFN Module Propeller Demo Code. OFN Module BASIC Stamp Demo Code. The Optical Finger Navigation (OFN) Module can add a unique human interface component to your BASIC Stamp or Propeller projects. 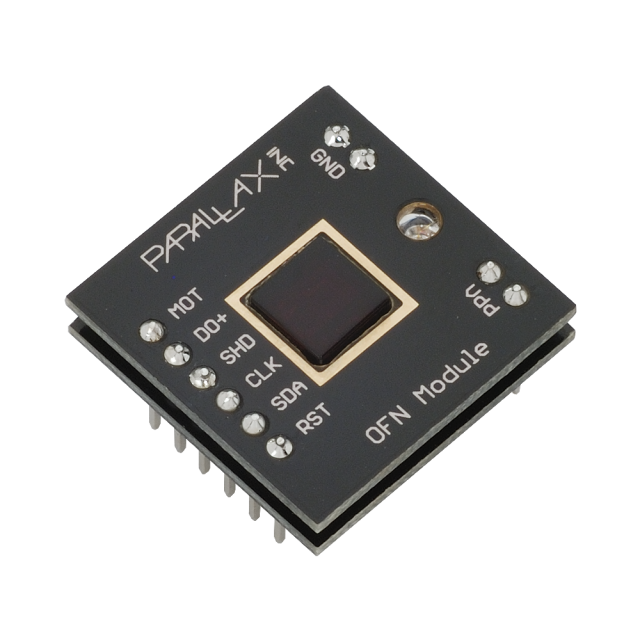 OFN Modules are quickly becoming popular as user input devices in many smart phones as a replacement for trackballs, which are subject to mechanical wear and tear. OFN technology is very similar to the technology used in optical mice, and movement across the sensor can be read by any microcontroller using I2C communication. Onboard red LED which lights when finger movement is detected. Easy I2C communication interface with virtually any microcontroller. Onboard voltage regulator conditions I/O to 3 V max for compatibility. User input for computing devices. Power requirements: 3.3-5.5 VDC; 25 mA active, 1 mA standby. Communication: Two-Wire Serial I2C (400 kHz). Dimensions: 1.0 x 1.0 x 0.55 in (25.4 x 25.4 x 13.97 mm). Operating temp range: 32 to 158 °F (0 to 70 °C).